The image of tough guys hijacking truckloads of goods is a familiar one to fans of gangster movies. While trucks are the victims of most cargo thefts globally—75% of them, according to one report—these incidents increasingly do not involve the theft of the entire tractor-trailer. Instead, cargo theft is increasingly characterized by pilfering: lifting a few boxes or a few pallets of products while a truck is parked at a stop. This tactic makes the job much easier for thieves, on several levels—they don’t have to hide the truck, for example—while making things more difficult for carriers, cargo owners, and law enforcement. Members of a theft ring based out of Kentucky spent years stealing millions worth of cargo from tractor trailers traveling along the interstate, according to the Federal Bureau of Investigation. Read Full Story Here. Happy 4th of July - Your freight has been stolen! The methods may change but the adage remains true, Freight at rest is freight at risk. BREAKING NEWS OUT OF MEXICO: "60 stolen trucks, tonnes of cargo recovered in Puebla"
Breaking News out of Wisconsin, "Ringleaders Sentenced In Massive Interstate Cargo Theft Case"
​SensiGuard reports cargo thefts were down 15 percent in 2017 from 2016, but that doesn’t mean there isn’t still a high risk of theft in the country. 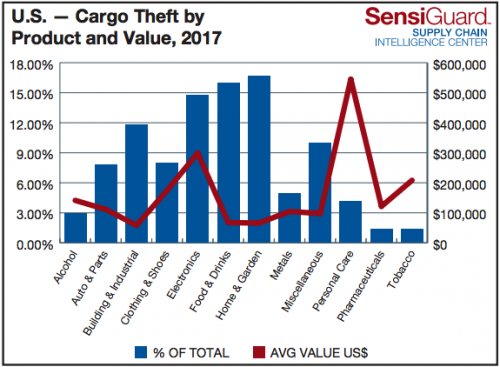 Cargo theft recording firm SensiGuard is reporting a 15 percent decrease in cargo theft volume in 2017 when compared to 2016, along with a negligible increase in average loss value year-over-year. The firm says it recorded 649 cargo thefts in the U.S. in 2017 with 146 in the first quarter, 132 in the second quarter, 177 in the third quarter and 194 in the fourth quarter. SensiGuard also reports an average loss value of $146,063, up just a tenth of a percent over 2016. Last month, cargo theft recording firm CargoNet reported a total of 741 cargo thefts in 2017. SensiGuard notes that while 2017 continued a downward trend in reported cargo thefts, that trend “does not indicate a decline in cargo theft risk in the U.S.” The firm adds that instead, thieves are homing in on specific loads that can be easily stolen or target specific products. For the first time in eight years, food and drinks were not the most-stolen products in a year. Home and garden items topped the list in 2017. In-transit thefts were most common in 2017, accounting for 78 percent of all recorded thefts during the year. Pilferage was the second-most common type of theft during the year, accounting for 15 percent of all thefts. Fictitious pickups saw a dramatic decrease in 2017, falling by 39 percent to account for just 3 percent of thefts. This decrease, SensiGuard says, was a result of the number of arrests, especially in Southern California, of cargo thieves. Additionally, 75 percent of thefts in 2017 occurred in unsecured parking locations, including public parking areas, truck stops and drop lots. Theft of full truckload incidents accounted for 78 percent of all thefts in 2017, followed by pilferage, accounting for 15 percent of thefts. For the first time in eight years, food and drinks did not top the list of most-stolen items in 2017. Instead, home and garden products took the top spot, accounting for 17 percent of thefts during the year. Food and drinks made up 16 percent of the 2017 total, a 14 percent decrease from 2016. Other highly-targeted products included electronics (15 percent of thefts), and building and industrial (12 percent).